After a successful Cash for Clunkers government induced spiff, the automotive industry is now left wondering what to do next now that the generous $3,500 - $4,500 clunker incentive rapidly faded away. GM’s marketing department has an answer: Bring back the 1980s with a Lee Iacocca wannabe and the return of the return policy. Much like when Iacocca asked America “if you can find a better car, buy it.” GM will now ask Americans, “if you bought a car from us, but found a better car between 31-60 days, providing you drove less than 4,000 miles, return our car and get the better car.” It doesn’t exactly roll right off the tongue. Who do you think builds the most fuel-efficient car? Who do you think builds the safest car? Who do you think builds the most dependable car? Who do you think builds the best performance car? Who do you think builds the best car? Results displayed showing everyone’s collective response against the response the quiz taker entered. It was an interesting test to see how dominant some brands are in each category. What it showed was how difficult it is for a brand to become synonymous with a particular attribute. It took all of the brands years to become recognized for best safety, best performance, etc. Now that we know GM is the one behind the mystery site, the results of the quiz show a mountain of a task GM has to change brand perception in a category. The funny thing is I think GM feels they can lead in all of the categories, meaning their brand or brands should be the top pick in any future quiz about best quality, safety, dependability, performance, fuel-efficiency, and overall. Nice try. If there is one constant reason why a brand ‘won’ in this quiz, it is because they are not trying to be all of these things. If you want a great example of what I mean, check out Peter M. De Lorenzo’s recent column warning BMW not to compromise their performance brand identity for a piece of the Green pie. Someone (I think we can all guess who) is reading from the Chrysler post government bailout playbook. Directly challenge the foreign and domestic competition so far as to even take on anyone willing to race Bob Lutz in his Cadillac CTS-V. The 60-day return policy is the big offer to get consumers interested in GM’s products. It’s the driver to bring people into the dealerships. But does this work? We know it’s been done before by many brands: Chrysler, Volkswagen, Pontiac, and Oldsmobile. Past return policy campaigns didn’t change consumer brand perception. Did anyone in 1990 really think any better of Oldsmobile or Pontiac because they guaranteed the purchase? One of the biggest issues with return policy effectiveness is the “fine-print effect”. The former Pontiac campaign brought in 5% more showroom traffic. In that same 1990 LA Times article the result of the infectiveness is that “there's so much distrust, and people may worry that it's not that easy to get in or out (of the deal), that there are probably a lot of gimmicks." So I have my doubts about the return policy being all that effective. Return policy aside, the most intriguing part of the “May the Best Car Win” campaign is the spokes model. 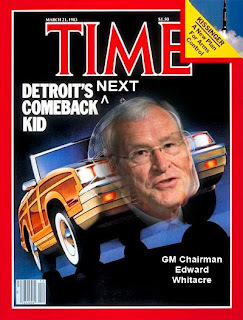 We learn that GM Chairman Edward E. Whitacre Jr., who from across a room resembles Lee Iacocca, tested well with research when GM ran the new ads featuring him. In today’s Ad Age, Bob Lutz says the campaign will present America with a new face for GM. "What we were looking for was a highly credible spokesperson who would be a new fresh face," Mr. Lutz said, noting that Mr. Whitacre "is the new guy in town. He's tall, good looking, has impeccable white hair and has this nice soft Texas drawl and limps a little bit when he walks, which sort of gives him this old cowboy look." Perhaps this is what’s needed, having a friendly, nice elderly man telling America this is the car to buy. It was the most effective and most memorable part of the Lee Iacocca playbook. It’s really Whitacre’s impact that will be the win or lose of this campaign. UPDATE: The Ed Whitacre spot showed up on YouTube. View it here. Looks very similar to Iacocca walking around the factory convincing the viewer they build the best cars and can challenge any brand. Tommy: Let's think about this for a sec, Ted, why would somebody put a guarantee on a box? Hmmm, very interesting. Note: I'm in no way knocking any company's quality. I typically try not to comment on Ford's competitors' efforts. This was just a friendly observation that the way you referred to the guarantee makes me think of this classic film.